Plus, he cleans the house! Here's a feel-good moment from Swiffer. A new ad for the brand stars an interracial family, which deserves some credit, if lamentably, in light of the idiotic controversy around last year's Cheerios ad. 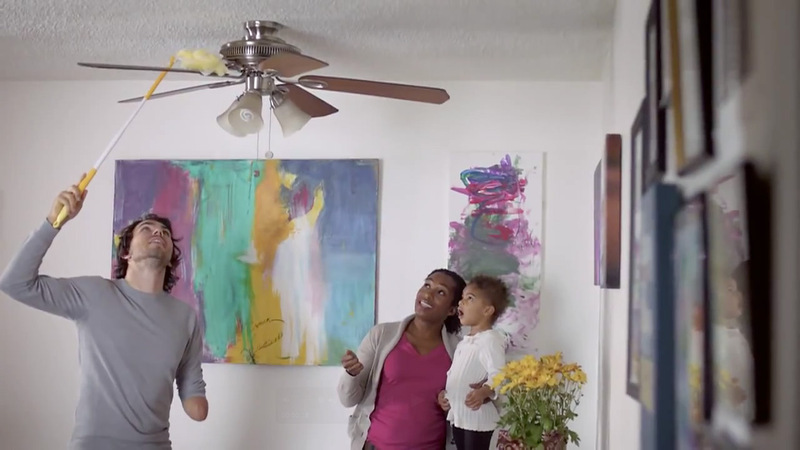 But also, Zack Rukavina, the husband and father in the documentary-style spot, also lost an arm to cancer—a fact that is central to the ad's narrative about how the brand makes cleaning easier, and which seems to be earning the P&G-owned brand extra points. Zack is also cast as an active participant in the cleaning, unlike Morty Kauffman, the husband in the geriatric Swiffer-endorsing couple from last year, who only does the laundry and leaves the rest to his wife, Lee. In fact, Rukavina even cracks wise about how much better he is at cleaning than his wife, Afi. The ad, by Publicis Kaplan Thaler, pulls so many progressive levers at once that it risks feeling contrived or opportunistic, but ultimately ends up coming across as real enough to actually warrant a rare bit of respite from cynicism. Enjoy.